Forty people were rescued from their flooded vehicles on the George Washington Parkway after heavy rain left standing water on the roadway Tuesday afternoon. WASHINGTON — Arlington County Fire Department crews helped rescue 40 people from their flooded vehicles on the George Washington Parkway after heavy rain left standing water on the roadway Tuesday afternoon. The flooding and response closed the parkway in both directions in Arlington between Bashford Lane and Reagan National Airport as rain rapidly fell around the region. 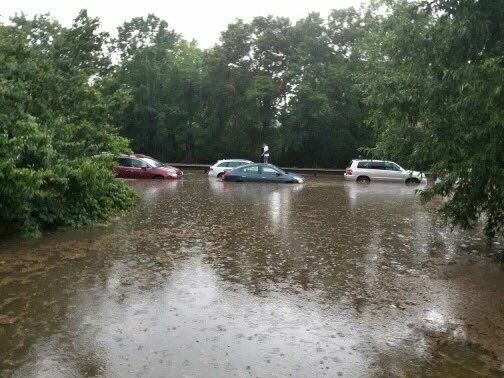 All lanes reopened around 5:15 p.m.
Arlington County Fire Department tweeted a video showing a row of vehicles with water up to their doors on the GW Parkway at Reagan Airport. “Avoid GW PKWY!! !” the department tweeted around 4:15 p.m.
Fire crews used boats to rescue the people stranded in the 25 vehicles. All of the people were rescued by 5 p.m., the fire department tweeted. There were no injuries or medical emergencies reported, the department said. Heavy thunderstorms moved through the region Tuesday afternoon. The National Weather Service issued a Flash Flood Warning for Anne Arundel County, Baltimore County and Baltimore City in Maryland until 6 p.m.; a flood warning has been issued for Arlington County, D.C., Fairfax County and Alexandria until 6:30 p.m. Conditions are continuing to change; stay with WTOP for the latest traffic and weather updates.